Hey dolls! 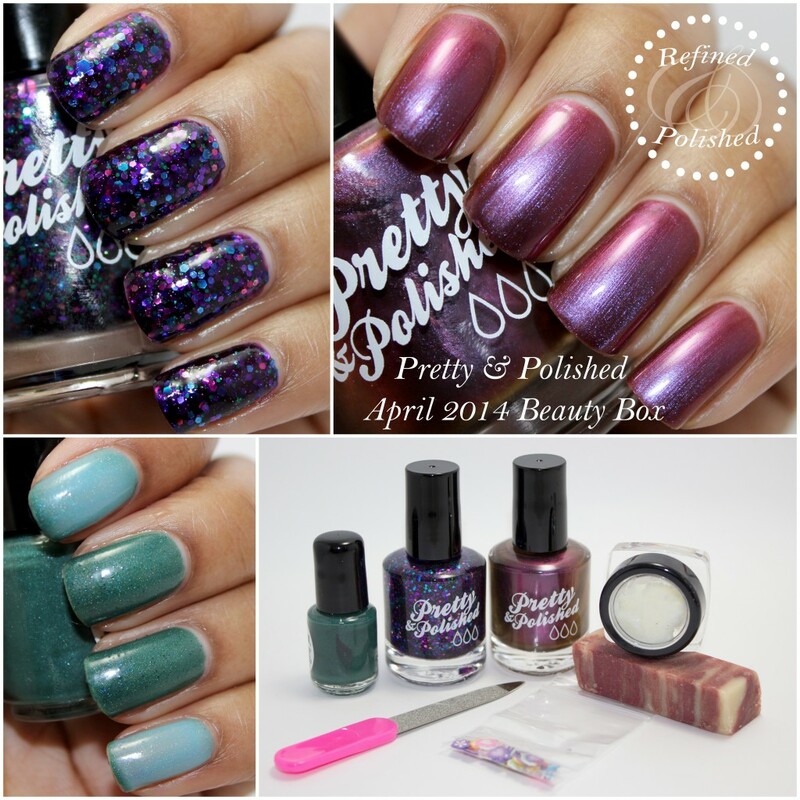 Today I have photos for you of the Pretty & Polished April 2014 Beauty Box. This box features two exclusive full sized polishes, a mini color changer, samples of body soap and cuticle butter, a mini nail file, and nail art accessories. Pretty & Polished Mardi Gras Rendezvous is a dark purple jelly base filled with purple, blue, and pink hex glitter in various sizes. 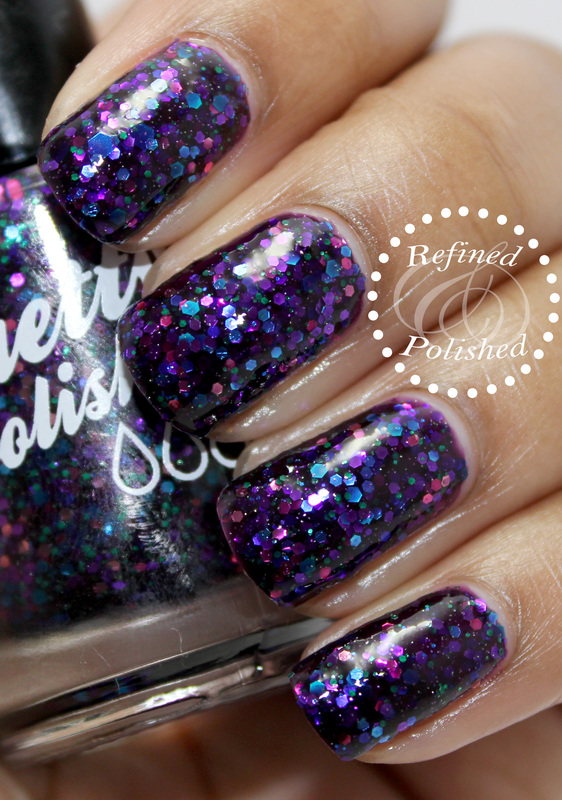 This polish is jam packed with glitter. Three coats were used for opacity, but you could also pair this one over a complimentary base to use fewer coats. Mardi Gras Rendezvous dried to a slightly gritty finish, so top coat was used. Pretty & Polished Life is a Bowl of Cranberries is a cranberry purple duochrome that shifts between flashes of orange and silvery blue. The formula was good, but I would recommend using light, thin coats to minimize visible brushstrokes. Three coats were used for opacity. Pretty & Polished Tomboyish is a thermal polish that is teal with subtle holo shimmer when warm and light blue when cold. The formula was very easy to use and applied nicely in three coats. Tomboyish dried to a satin finish, so top coat was used. This is another great beauty box from Pretty & Polished! I’ve been interested in trying more of her bath and body products, so I’m glad samples were included. The citrus cuticle butter felt very smooth going into my cuticles and absorbed rather quickly without leaving greasy residue behind. A little of this product goes a long way, so only a smidgen is needed per nail. The scent of the cranberry fig cold process soap reminds me of the holidays, but not in an overpowering way. The soap lathered nicely and left my hands feeling soft and moisturized. I’m not big on using scented products on my body, so this will be reserved for my hands. At the time of publishing this post, the Pretty & Polished April 2014 beauty box is still available for purchase here. A one month subscription is $22 for US buyers and $30 for international buyers (shipping included) and multiple months can be purchased at once. Be sure to keep up with Pretty & Polished on facebook, instagram, and twitter for new releases, giveaways, and specials.